Equally at home turning hollow forms or shear scraping, the Robert Sorby® Straight Shank Multi-Tip Hollowing Tool features a flat bottom shaft that increases contact with the tool rest to counteract torque. Change from pivoting hollowing cutter to shear scraper quickly and easily. Comments On Feb 17, 2016:This is a great tool and very well constructed. It's easy to sharpen and the cutters hold a good edge. Be aware there is a learning curve, like all special tools for the lathe. Get some scrap and practice, practice, and then practice some more. I use it for everything from boxes to larger hollow forms. It would be my opinion that about six inches would be its max depth and you will need to be able to work through about 1 1/4" opening. 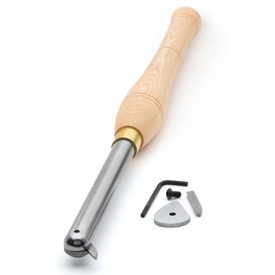 The scraping that this tool allows is almost worth the price of the tool alone. Comments On Nov 26, 2013:I used to try using several tools to hollow with but I could never seem to get the forms as thin as I wanted. That changed with this tool. I can change the angle to whatever I need by simply loosening the screw and moving the cutter. You could try to make your own hollowing tools but this thing makes hollowing a breeze.